Mu was the Second Tsuchikage from the Village Hidden by Rocks. He was the mentor of Onoki the Third Tsuchikage. There was a battle between Madara Uchiha and both Tsuchikages Mu and Onoki where they were defeated. Mu [Second Tsuchikage] has great enmity with Gengetsu Hozuki [Second Mizukage] where both killed each other. Let’s take a look at Mu [Second Tsuchikage] abilities in Naruto Online game. Taijutsu & Ninjutsu Particle Style – Atomic Dismantling Jutsu[Prompt]: Causes Earth, Wind and Fire attributes damage to the opponent’s entire team, the selected target will suffer from Knockdown. Opponent’s units defeated in the battle will not revive. If the Stone Golem has not been defeated, this skills’s damage will be greatly increased. Ninjutsu Earth Style – Weighted Boulder Jutsu: Attacks the opponent’s units in the front row and has a fixed chance of causing Low Float. Taijutsu & Ninjutsu Earth Style – Weighted Boulder Jutsu: Chases and Attacks Knocked Down unit, causes Knockdown and Immobile. Ninjutsu Fission Jutsu: At the beginning of a battle summon 1 Stone Golem based on 70% of the unit’s attributes. Only 1 Stone Golem can be created at a time. Ninjutsu The Soul’s Strength: If this unit is defeated, it will resurrect 2 rounds later with 30% of it’s original Life points. Will release the same skills this unit released when he entered the field. 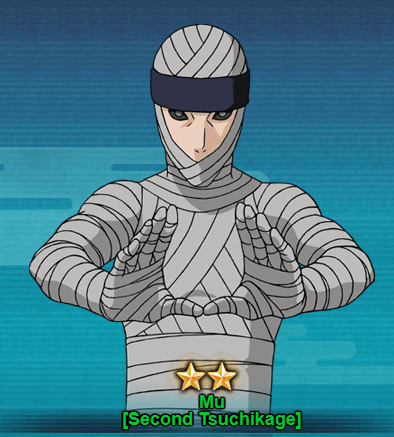 You will only receive 2 star ninja of Mu [Second Tsuchikage]. You can draw him from the Edo Tensei treasure within 30-40 seal scrolls or Great Ninja War (GNW) treasure in 10-20 seal scrolls draw. I’ve seen Mu available in some of the events as well. You can checkout some of the weekly events in future to get Mu.